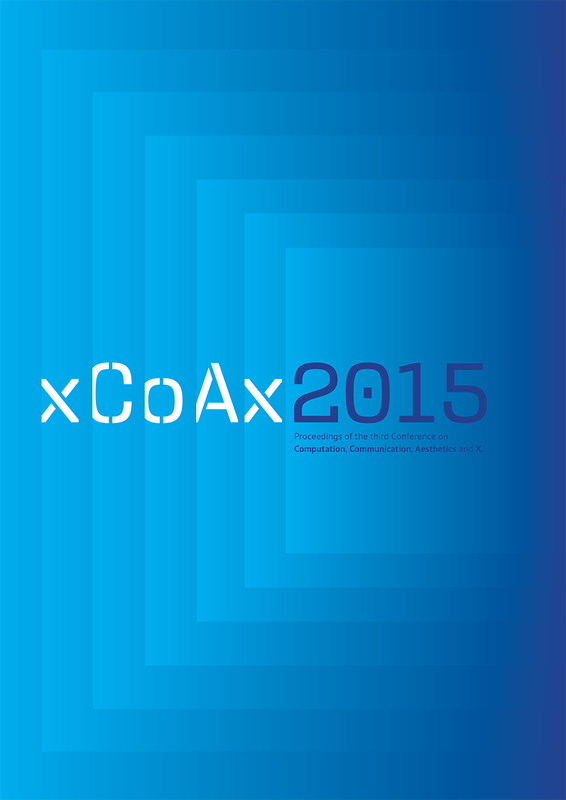 xCoAx 2015: Third Conference on Computation, Communication, Aesthetics and X.
xCoAx 2015: Proceedings of the Third Conference on Computation, Communication, Aesthetics and X.
William Latham was one of the pioneering UK computer artists and rapidly gained international reputation in the 1980s. His work blends organic imagery and computer animation, using software modelled upon the processes of evolution to generate three-dimensional creations that resemble fantastical other-worldly forms such as ancient sea shells, contorted animal horns or organic alien spaceships. His latest exhibition Mutator 1+2 , produced in collaboration with mathematician Stephen Todd, features interactive projections that blur the barriers between art and science. The static and unchangeable printed page seems to be hardly considered in years 2010s as a key tool for political and radical strategies, as human beings are constantly looking at a few personal screen-based devices, most of them updated in real time. But there are a few cultural elements in traditional media, which are still playing a decisive role in the circulation of culture. Among them the recognition of their aesthetic “forms,” even if digitised in both design and content. The familiarity with those forms is based on metabolised “interfaces” (we’re all culturally “natives” when it comes to radio, tv, and print) that makes them almost invisible, especially when translated for the digital realm, delivering the content in a more direct way. And since we recognise those forms instinctively, we “trust” them, and so we trust their content. The paper explores the concept of artistic prototypes to analyse a strand of new media art generated within research or activist contexts. Two key features of a framework for artistic prototypes, openness and fictionality, are explored through the discussion of two artworks which embody a sense of prototypicality. The contingent, situated interpretation of knowledge emerging from creative practice-based research is associated to the instability of prototypes proposed as a paradigmatic object for experimentation. Computational visual media presents peculiar aesthetics features that are commonly explored by an instrumental use of technology. This paper introduces three art projects that propose a different perspective on enquiries of digital aesthetics: these works are based in conceptual frameworks, that highlight the technological manifestations of visual devices. The aim of these projects is to brake the immersivity of media representation, in order to reveal the essence of digital image. Each project reflects into specific concepts, here called: interpretation, representation, and material properties. These argumentations take into account the processuality of computation, as well as the materiality of media, as distinctive elements which place the medium identity over its function. The paper presents examples of digital art in Japan and examines its roots in traditional East Asian philosophy giving the senses a prominent role in perceiving the world and enabling a perfect symbiosis between humans and machines. The research reflects on the expansion of this culturally and traditionally inspired spirituality from its original context in the socio-cultural interpretation of the natural world to contemporary digitally mediated environments. This is accomplished through analysis of digital interactive work by specific artists located in Japan, such as Kumiko Kushiyama, Masaki Fujihata and Ryota Kuwakubo. What is it that characterizes the practice of intermedia thought? Is intermedia thought an actual phenomenon, or is it already out-of-fashion? Before the apparent lack of peer’s consensus as to the actuality, terminology, and meaning of the term ‘intermedia’, this article presents the main characteristics and antecedents of intermedia thought and practice previously identified by other authors and, based on an actualized study, expands the set of these attributes, proposing the inclusion of the characters presentative and indisciplinary. An amplified review of the literature allows us to support a philosophical approach that demonstrates the actuality and appropriateness of Coleridge’s original conception of the ‘intermedium’, as well as the affinity between intermedia and experimental chemistry, given its transformative, laboratorial, and experimental character, and its capacity to create new media through the fusion of existing media, in an open autopoietical process. This paper presents the process, approach and results for Visualising Electromagnetic Fields. A project that produced a toolkit and visual vocabulary for technological exploration–through light-painting and long-exposure photography–to capture, visualize and communicate invisible electromagnetic fields that surround everyday objects. The project acts as a case-study to answer a need for work that combines scientific and artistic practices. To create a open dialogue between the public, scientists, designers, and engineers in a way that provides a visual language for understanding and critical discussion. Elastic displays empower users to interact naturally through pushing and pulling, folding and twisting. While this kind of interaction is not as precise as on other devices, it utilizes interaction metaphors which are easy to learn and understand. We present a system that uses physically based interaction and visualization metaphors to gain a deeper comprehension of the underlying data and its structure. By applying pressure on specific interface elements, associated items are attracted and repelled, the exerted force on the items itself translates into a semantic zoom behavior to display more in-depth information about the specific entity. We present the core concepts of the system, explain the decisions made during the design process and discuss the advantages and disadvantages of the proposed system as well as a short view on further improvements and open research questions. This paper will examine a range of philosophies surrounding aesthetics and begin to speculate on a metaphysical framework surrounding artificial aesthetics. Tracing earlier arguments from Hegel and Kant and extracting significant developments in newer variants of speculative realist philosophies, this paper seeks to critically engage the realm of aesthetics and computation from a metaphysical viewpoint. These metaphysics touch on issues of non-human agency, inter object relations, and aesthetic theory in relation to computational entities and autonomous systems. The ability of these systems to operate outside of human cognitive limitations including thought patterns and constructions which may preclude alternative aesthetic outcomes, afford them in some ways limitless potential in relation to aesthetics. Aesthetics here are not narrowly constrained by a human ability to recognize or appreciate these outputs. The designation of the accidental or provisional is utilized as an alternative approach to the production and assessment of aesthetic occurrences. The paper examines the changing culture of the arts in the digital age as the parameters of the artist expand, demanding diverse skills, flexibility, and an entrepreneurial outlook, focusing on how that impacts the training of the artist in an increasingly interdisciplinary, collaborative, technological, socially engaged environment, including a model for training the interdisciplinary performance artist employing digital media and engaging in community collaborations, the Performance and Interactive Media Arts Program at Brooklyn College. We developed water based electronic elements. These elements are built into electronic circuits to control different parameters of electronic sound and video tools. As a result of our research we constructed a complex controller, with the main component of water. With this tool it is possible to control analog and software synthesizers as well as video-software and all kind of electronic devices especially microcontroller based platforms like Arduino or Raspberry. Consumers as co-producers or co-designers are frequently presented as the solution for mass-customization, but the success of these systems as enhancing emotional bonds between user and object seems to be questionable. Making choices may not be enough to generate a bigger connection between people and their things. Artifacts produced using biological systems with generative potential, where nature’s randomness and physiological processes have an important role in the definition of form, may have the capacity to foster the emotional connections that are missing, arising from nurturing and from an understanding of their morphogenesis, from the proximity and time required for their growth and development. We present a family of sonic interactive objects called Stonic. They are designed to provide users with different affordances, i.e. action possibilities, associated to specific sound feedback. These objects are used in experimental studies to explore how augmented auditory feedback influences the object manipulation.We selected a set of basic interactions based on studies on the auditory perception of physical interactions producing sound, These interactions correspond to different ways of manipulating the objects, leading to a set of design. requirements. Twenty initial objects were made with acrylic resin and/or polystyrene. Each different shapes were tested in order to select a smaller number of objects affording a wide variety of actions. The selected shape were finalized using 3D printing and equipped with several sensors: Force-Sensing resistor (FSR), Piezos and an Inertial Measurement Unit. Specific software was made to enable real-time recognition of the different interactions and for the mapping of each actions to specific sound processes. Arcade laserdisc videogames were pioneered by the original 1983 release of Dragon’s Lair from Advanced Microcomputer Systems. Alas, the punishing gameplay mechanics of Dragon’s Lair left many players frustrated. The 1984 laserdisc game, Super Don Quix-ote, from Japanese developer Universal, continued to employ a traditional animation technique, while including on-screen prompts, providing the player with a helpful indication of the correct response to each challenge. By completing Super Don Quix-ote, without loss of life, a maximum score of 636500 can be achieved through routine gameplay bonus mechanisms. Super Don Quix-ote, however, also includes undocumented support for alternative responses to the on-screen prompts. In the project described here, the open-source Daphne laserdisc emulator; along with Super Don Quix-ote software including a binary ROM image of the game itself and associated video files; are provided as input to a computer vision system, proving a perfect score of 776500 is possible; then confirmed by the human hand. Computers are our ultimate modelling machines. In the last decades, they became our first “metamedium”; the foremost means through which we generate, store and exchange media, but also our primary instruments for thinking. As a consequence, these “quintessential” products of information technology forever altered the way we think about reality, the world and ourselves. This paper argues our limited understanding of such transformations is one of the major impediments for developing adequate descriptive models for computational media. By showing how information technology is “re-ontologising” our world and stimulating a “permanent beta” attitude within contemporary technological culture, this paper shows that, without an adequate reformulation of our ontological commitments, our future analyses of media will be significantly hindered. By focusing on the metaphysical implications of current technological development, this paper shows the often neglected overlapping between philosophy and media analysis, but also the theoretical benefits of promoting it. Procedural media allows for unprecedented modes of authorship and for the development of new aesthetic experiences. As artists and communicators, but also as readers and users of these systems, we should be aware that their aesthetic potential is not simply defined by direct interaction. Although direct interaction is one of the most perceivable components in the relationship between ergodic media or artefacts and their readers, one should not forget that the reader’s interpretation and capacity to apprehend and simulate the processes developed within these artefacts is continuous, ever present and significant. In this context, this paper argues that not only ergodicity does not necessarily imply direct interaction, but also that non-interactive procedural artefacts are able to allow the development of ergodic experiences, not through direct interactions but rather through simulated interactions, by understanding procedural activities and developing mental analogues of those processes. We aim at raising this awareness, setting up the grounds for designing for what we call virtuosic interpretation, an activity that can be described as the ergodic experience developed by means of mental simulations. The legitimation process of a new medium as an accepted form of art is often accelerated by its adaptation by acclaimed artists. Examining the process of acceptance of popular culture, such as cinema and comic books, into the art world, we can trace historical parallels between these media and videogames. In recent years, videogames have been included in exhibitions at specialty museums or as design objects, but are conspicuously absent from traditional art museums. Artists such as Cory Arcangel, Anne-Marie Schleiner and Feng Mengbo explore the characteristics of videogames in their practices, modding and adapting the medium and its culture to their needs, creating what is often called Videogame art, which is widely exhibited in art museums but often criticised within the videogames community. This paper aims to give a perspective of Videogame art, and explore its role in the legitimation process of the videogame medium by the art world. We present results of two studies that address creative decision-making through the usage of local resources. Adopting an opportunistic design approach (Buxton 2007; Botero et al. 2010; Visser 1994), both studies use off-the-shelf infrastructure to identify support strategies that deserve further implementation efforts. Both studies yielded complete creative products, consisting of a mixed-media performance artwork and a multimodal installation. We discuss the procedures employed to assist the decision-making processes with an eye on the development of new creativity support metaphors. 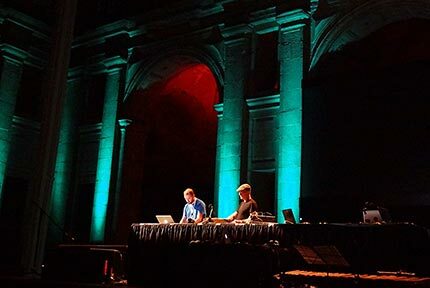 The examples serve to frame the discussion on human-computer interaction and musical creativity in the context of ubiquitous music making. Multi-agent systems commonly exhibit complex behavior resulting from multiple interactions among agents that follow simple rules. In turn, complexity has been used as a generative and organizational paradigm in audiovisual works, exploiting features such as behavioral and morphological complexity with artistic purposes. In this work, we propose to use the Actor model of social interactions to control a concatenative synthesis engine called earGram in real time. The Actor model was originally developed to explore the emergence of visual patterns. On the other hand, earGram was originally developed to facilitate the creative exploration of concatenative sound synthesis. The proposed integration results in the emergence of complex behavior from the Actor model acting as an organizational paradigm for concatenative sound synthesis. This paper presents a system for controlling the structure of synthesized sounds at the waveform level using physical gestures. The purpose of the system is to allow intuitive, natural, and immediate interaction with a sound synthesis model based on a non-standard synthesis technique. Instead of manipulating numerical parameters which are, in case of non-standard synthesis, typically abstract and without acoustical meaning, musicians can shake a mobile device in order to shape the structure of synthesized waveforms. The system receives raw data captured from accelerators, extracts relevant statistical features, and maps them into parameters of a dynamic stochastic synthesizer. Mapping is based on fuzzy logic in order to ensure a non-linear and non-injective relation defined within explicit mapping rules. Experimentation proves that the system provides natural, immediate, and expressive control which is convenient both in the com- position process and in live performances. 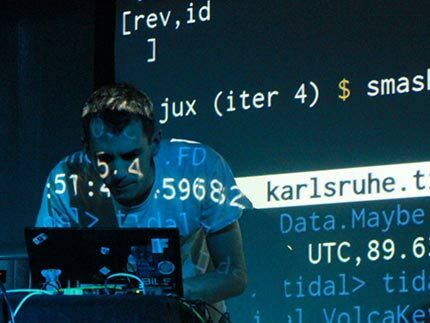 Reflections on a number of live coding collaborations with improvisors, choreographers and performance artists, drawing from informal discussion and audience feedback. This article explores how smart materials, and in particular thermochromic silicone, can be integrated into a wearable object in combination with microelectronics to create aesthetically coherent stimulus-reactive jewellery. The different types and properties of thermochromics are discussed, including experiments with layering pigments that react at different temperatures within three dimensional silicone shapes. The concept of creating digital enchantment through playful interaction is introduced, illustrating how accessible microelectronics can be used to facilitate the creation of responsive jewellery objects. Bringing together digital methods of fabrication with craft methodologies to create objects that respond intimately to changes in the body of the wearer and the environment is presented as an outcome of this research project. Moving towards the notion of a posthuman body, potential practical applications for these jewellery objects exist in the areas of human–computer interaction, transplant technology, identity management and artificial body modification, where such symbiotic jewellery organisms could be used to develop visually engaging, multifunctional enhancements. A unique power of virtual objects is that they do not have to look, feel or behave like real objects. With this in mind, we have developed a virtual cube that is part of our real, physical environment but, unlike real objects, is invisible and non-tactile. ‘Touching’ this virtual object triggers binaural sounds that appear to originate from the exact spot where it is touched. Our initial experimentation suggests that this sound-based approach can convey the presence of virtual objects in real space and result in almost-tactile experiences. In this paper, we discuss the concept behind, implementation of and our experience with the sonically tangible cube and place our research in the context of tangible interaction, perception and augmented reality. This paper describes the creative process behind an artwork that combines and projects data in sculptural ways. This projection comes in the form of a reimagined magic lantern device called the Magic Lantern Horror Vacui Data Projector. This device is the result of collaborative glass art and electronic art techniques. Central to the projection system are re-envisaged glass magic lantern slides. No longer flat, they are squat six-sided boxes made entirely of glass. These slide boxes are filled with data-representational glass forms through which light is projected. The projected images are emitted from a three dimensional aggregate of data represented by coloured pieces of transparent glass. The appearance of the projection is manipulated by positioning these slides along varying axes through servomotors. Code is being developed to read input from the projection, generate additional data, and control the positioning of the boxes. The ZoOHPraxiscope combines the overhead projector with a spinning picture-disc and it works similar to the Zoopraxiscope. The Zoopraxiscope is a historical device that was invented by Eadweard Muybridge to animate sequences of pictures. The ZoOHPraxiscope allows to combine direct animation and shadow play with cinematographic animation. Using custom made electronics to control both flicker frequency and rotation speed of picture-discs, it is possible to play with various regimes of animation. As motion and light flicker are directly coupled to sound, the device is also a performance instrument for audio visual performances. Skyler et bliss is an audio-visual installation by Laurent Segretier (video) and Monty Adkins (sound). The work was presented as part of the Cabinet de Curiosités de Thomas Erber from 20th November - 21st December in Bangkok. The installation presents a slow shifting landscape of ice floe. 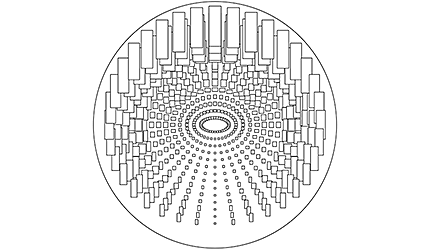 The layers of processing activity are reflected in the multiple sonic layers. The installation is to be played on a continuous loop. Up Down Left Right is an audio/video installation that generates a ‘permutation narrative’ in realtime based on the concept of contingency. The character in this narrative is a little yellow cursor that creates bass tones as it moves through an unstable world of shifting-dissolving color blocks. The cursor’s behavior is solely governed by its internal ruleset in response to this dynamic environment: white = up, black = down, red = left, blue = right, etc… An algorithm randomly selects permutations that control how the color blocks are animated as well as how the sounds are triggered. There are a finite number of color block landscapes that form around the cursor as it moves. The transformation from one landscape to another completely depends on the cursor’s coordinates at the time of change: x-coordinate determines time length of the next landscape; y-coordinate determines which landscape to trigger. Thus, the cursor’s behavior influences the environment just as the environment influences the cursor’s behavior. Different landscapes offer the cursor different navigational potentialities/limitations which alter and shape the musical patterns and overall form of the piece. Since the underlying permutations are randomly chosen, each time the piece runs the cursor’s trajectory will not be the same and the narrative will have a different sequence of events. Unknown Meetings is a site-specific augmented reality project for the Glasgow Subway that takes as its premise the awkward and surreal encounters that occur on daily commutes. Subway riders activate via smart phone both an “unknown” object moving over the actual landscape and an accompanying brief poetic audio file which considers such encounters. Unknown Meetings evades the political feuds, environmental upheavals, and social displacement with which ordinary public transportation is so often burdened. It thus offers a critique of systems of connection as it disrupts a sleepy morning or weary late afternoon commute with singularly odd encounters. Colorigins is a tactile color mixing and matching game designed and developed for the Sifteo Cubes tangible computing platform. By physically manipulating a set of Sifteo Cubes, players attempt to match a target color by mixing a provided set of source colors. Throughout the process of color mixing, players can gain experience with key color theory concepts such as value, saturation, tints, shades, tones, complements, chromatic neutrals, and the relative visual strengths of particular colors. A custom algorithm that references the spectral reflectance values of Colorigins’ source colors enables the game’s digital approximation of subtractive color mixture. The AR/VR_Putney 1.0 is an interactive installation exploring extensions of our perception of reality. It employs a virtual 1969 VCS3 synthesizer to transcend the boundaries between virtual and augmented realities throughout sound. In the proposed ludic experience, visitors co-interact in a game-like immersive environment, to construct the vocabulary of a shared sonic-centric experience, which triangulates between the real, the virtual and the enhanced. Potentiometers, VU meters, patch-pins and electronic components spring from the AR markers in the walls and wearable t-shirts, so that users can collect pick them up and transport to the virtual VCS3 in the middle of the room. As the synthesizer parts are being assembled by visitors, the purposely-composed mosaic of vcs3 original recordings becomes gradually organised. As a result, sound and music composition provide the integration for both experiences as extensions of reality. We intend to present the results of a test that is part of an ongoing investigation where artifacts are produced by biological systems with generative potential. In these systems where nature’s randomness and physiological processes have an important role in the definition of form, we understand that artifacts have the capacity to foster new, emotional, connections that arise from their nurturing and from an understanding of their morphogenesis. In contrast to mass-production and co-design systems, for these biological systems to grow into final products, they have to be understood and nourished by their users. Their end results are singular and unique, with aesthetic qualities that arise from the understanding of the artifacts’ growth constraints and the bonds that are created with them. The traditional quality canons of mass produced goods are challenged, as the resulting artifacts will not get final shapes that are both polished and free of imperfections, but that are inconstant, gnarly and sinuous. Fermata is a piece written for a microtonal drone instrument called Threnoscope and an acoustic instrument. It is a framework for improvisation of microtonal music, where both the live coder and the instrumentalist contribute equally to the piece's development. The Threnoscope is notated through live coding, with sounds being represented on a graphical score next to the coding terminal. Its visual appearance illustrates the harmonics of a fundamental tone, as well as speaker locations. Musical notes move around the spectral and physical space, long in duration, and sculptable by the performer. Fermata has been performed with Adriana Sá (London), Miguel Mira (Lisbon), Iñigo Ibaibarriaga (Bilbao), Áki Ásgeirsson (Reykjavik), Alexander Refsum Jensenius (Oslo), and now with Pete Furniss on the bass clarinet. Putney “K” is an interactive media work featuring a virtual VCS3 synthesizer created with a graphics-physics-game engine and originally composed and designed by Ricardo Climent. In 2015 the piece's concept was further explored in the form of two collaborations, which expanded its existing degree of expression and interactivity. 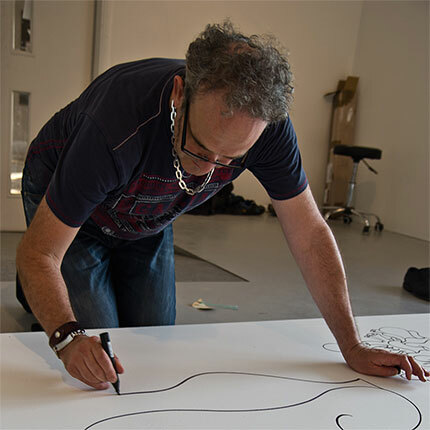 The first incorporated Mark Pilkington's creative input via the live performance of an original EMS VCS3 analogue synthesizer (interacting with the virtual one played by Climent), and the second was a sound installation entitled ARVR Putney by Manusamo&Bzika, which combined augmented and virtual reality. This concert version introduces a range of uncontrolled sonic fantasies (aural paidia, as in R. Caillois’s typology). The main character (called Putney) is a potentiometer and sonic scanner retired from a classic 1969 VCS3 synthesizer. To return home at Putney Bridge in London, the performer must collect components (vernier pots, VU meters, knobs, pins), electronics (PICS, capacitors, resistors) and circuit schematics and needs to solve a number of aural challenges (ludus) and earn enough compositional esteem. 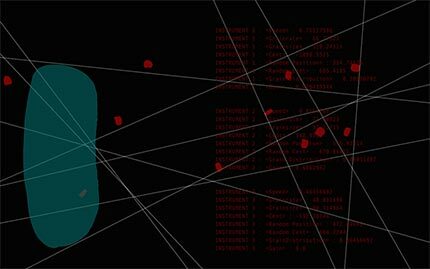 The game engine's play-through provides a dynamic graphic score for Pilkington, while opening communication channels to allow a number of performers to take part in an extended musical network. The performer of the real VCS3 takes on the role of a game player and interjects dramaturgy through the expression and manipulation of the instrument, to form a dynamic musical interplay. The synthesizer's unique semi-modular design and wild/chaotic character portrays a disruptive link within the flow of the piece, while its tactile embodiment extends the virtual beyond the frame of the screen. The act of play and containment becomes the boundaries that provoke intertwined emotional responses informed by chance, indeterminacy and algorithmic decision-making processes. Two systems of difference between the poles of the virtual and the real provide a homomorphic experience in which the viewer becomes engaged and immersed. The point of intersection of the two sensory fields is a thrilling an inspiring experience as it coexists between congruence and incongruence. 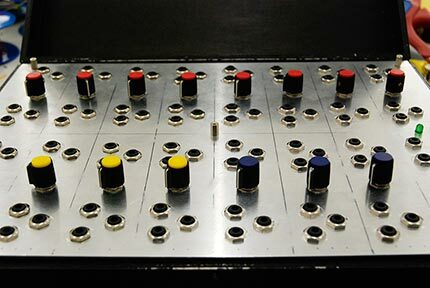 The giant vcs3-gamepad controller for Putney was commissioned to and designed by Iain McCurdy. We developed water based electronic elements. These elements are built into electronic circuits to control different parameters of electronic sound and video production. As a result of our research we constructed a complex controller, with the main component of water and its movement. With this tool it is possible to control analog and software synthesizers as well as video-software and all kind of electronic devices especially microcontroller based platforms like Arduino or Raspberry. 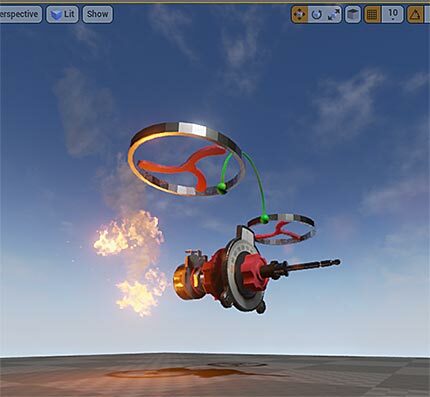 Thermospheric Station is an interactive dance and sound collaboration using the game controller, Gametrak , as the interface to connect sound and movement. Gametrak’s motion tracking system is very simple compared to other interactive technology now days such as Kinect . 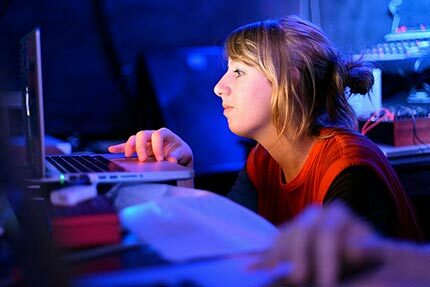 In this article I explain how Gametrak was used in Thermospheric Station to create sound and dance improvisation with its very reduced and limited functions. Most importantly, I illuminate the aesthetics of the composition as a digital artwork with the use of motion tracking technology of the controller. Drei Mal Acht || 24 is a performance for a personal computer, a human being, a "construction kit" of various text fragments, a "steering force" motivated particle system and the audience. Starting with simple text fragments about very basic bodily functions which are usually taking place without any reflection or conscious control, like blinking or breathing, the work combines different layers of text, human interaction, computational process and perception. Various algorithms (used to define how particles interrelate to each other) are waiting in line to successively hijack the parameters of granular synthesis in a Csound data set created for live interaction. The particles roam, along apparently random coordinates, continuously trying to find the best way in an ongoing calculation process. In combination with concentric circles the particles move towards each other simulating an emergent system and implying further fields of association. The Scottish School of Flower Arranging (James Wyness & Graeme Truslove) create freely improvised music from hand-made acoustic and digital instruments. Their music investigates asymmetry, materiality, irregularity, economy of means, and the emulation of natural processes. The name is derived from the Japanese zen-influenced practice of flower arranging and also pays homage to similar socio-aesthetic activities such as the tea ceremony, where the qualities of restraint, careful placement of elements and detachment are highly valued; as are attributes of wabi-sabi, such as the imperfect, the impermanent and the intimate. Rectangular Rotation is an audiovisual performance based on a modified overhead projector, the ZoOHPraxiscope . Analog electronics are used to control motors and generate movement and sound. These movements are projected and create an animated shadow play that is always in sync with the sound. In addition the projector light can be switch at hight rates, to create flickering light and cinematographic animation of rotating picture discs. 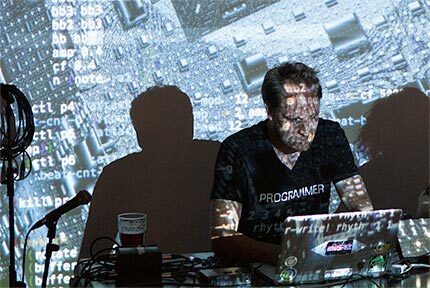 As code-fuelled ravers dance to wonky algorithmic glitches, an onstage battle of wills will occur as the Algorave programmer coerces SuperCollider’s JITLib into an inevitably noisy landscape of deformed calculations and deviant beats. A performance narrative is derived by searching twitter during the performance for tweets containing the words “algorithm” and “rave”. 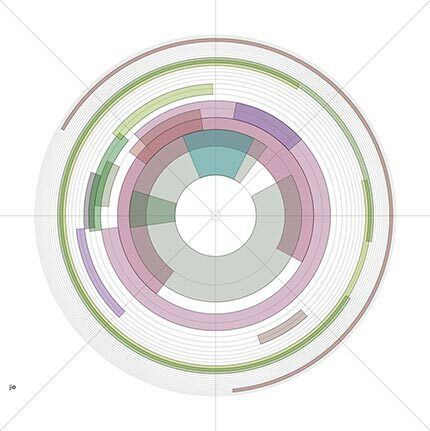 Scanning collected tweets for commonly occurring words provides ad hoc and abstract performance directions and an artificial social commentary on the performer’s genuinely antisocial code play.